View More In Cake Knives - Page 4. Have a slice of the good life with French Bull's Viva Cake Knife. French Bull's high-grade glazed melamine cake knife is great for the home or as a gift. It's 11.5" length will smoothly cut into any cake or dessert. 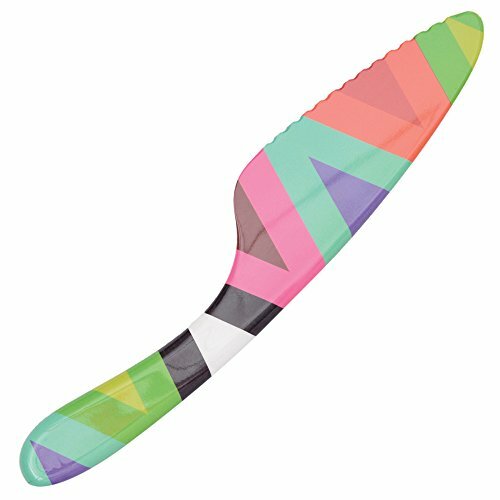 Our 11.5" cake knife is easy to clean since it's dishwasher safe, and heat resistant to 356-degree F, 180-degree C. Melamine is resistant to high heat, it's shatterproof, and an ideal ground for pattern. Plus, melamine is food safe and does not easily absorb fluids from food, which helps you avoid contaminating your food with harmful bacteria - a leading cause of illness and food poisoning. The durability and functionality of the material is perfect for indoor or outdoor entertaining. French Bull - reinterpreting everyday staples with a fresh, modern spin. Food safe high-grade glazed melamine cake knife; design by French Bull. Scratch and shatter resistant; non-absorbent; BPA-free; 11.5-inch length designer cake knife great for any cake or pie. Heat-resistant to 356-degree F, 180-degree C; dishwasher safe; not for microwave use. Coordinate your look or playfully mix-and-match with French Bull's myriad other lively patterns and solids. If you have any questions about this product by French Bull, contact us by completing and submitting the form below. If you are looking for a specif part number, please include it with your message.